After a successful trial construction of a home last year, there are plans in one region of Mexico to use the sargassum washing ashore as the building material in the development of a hotel. 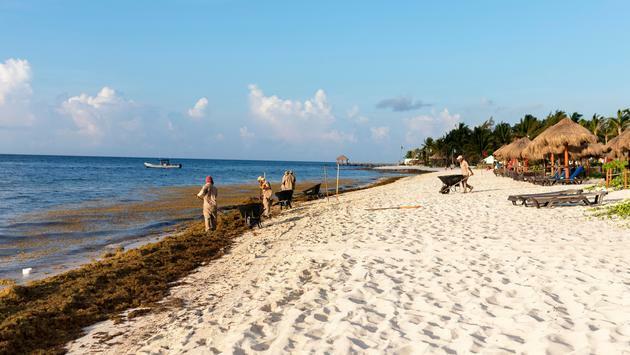 According to the Riviera Maya News, businessman Omar Vazquez Sanchez originally shared the idea with lawmakers in regions impacted by the influx of the seaweed to their beaches, but the idea is gaining momentum after he successfully built a house made of bricks made of sargassum. Sanchez said the hotel would be built in Tulum using the sargasso bricks, providing a way to eliminate the seaweed from the beaches while also providing the nation with new building material. As the owner of the Blue Green nursery in Puerto Morelos, Sanchez revealed the project would be environmentally friendly and could be used to provide affordable housing for low-income families. “We can say that it is cheaper because of the type of material used, and this will help to counteract the presence of marine waste on the coast, since as we know, it exceeds several tons and is not a good use for many other things,” Sanchez told the Riviera Maya News. The Quintana Roo government and other companies throughout the region who see the opportunity to use more inexpensive building materials have expressed interest in the project. The hotel proposed for Tulum will require thousands of bricks made from sargassum and a resistant mixture to ensure consistency and waterproofing. Sanchez said the only downside is the blocks would not be tremor resilient, but he claims that shouldn’t be a problem since the area is not a seismic zone.